LED is not a display technology. Instead it’s a reference to the light source used. LED projectors have a significantly smaller footprint than those that use traditional projector lamps. Read on to find out if these projectors are right for you. LED projectors are similar to most other projectors. The only difference is the bulb. Rather than use a traditional projector bulb, these projectors use a combination of red, green, and blue LED’s. These LED’s use a low-heat, low-energy process of semiconduction to generate energy, creating an electric signal which gives off a particle of light. This light then gets reflected off of a DLP chip or passed through an LCD chip. When these red, green, and blue LED’s are all combined, they can create an almost exact color match of white light. The biggest advantage of LED projectors is their lamp life and low heat output. LEDs last at least 10 times longer than traditional projector lamps. Many LED projectors can run for 10,000 hours or more. Since the lamp lasts the life of the projector, you don’t have to worry about buying new lamps. Because LED’s are so small and only need to semi-conduct, they operate at much lower temperatures. This means that they don’t need as much airflow, allowing them to be quieter and more compact. Much faster start up and shut down times as no warm up or cool down is needed. 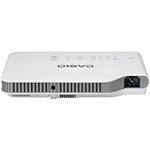 LED projectors are also much quieter than projectors that use traditional lamps. The biggest disadvantage of LED projectors is their brightness. Most LED projectors max out at around 3,000 - 3,500 lumens.